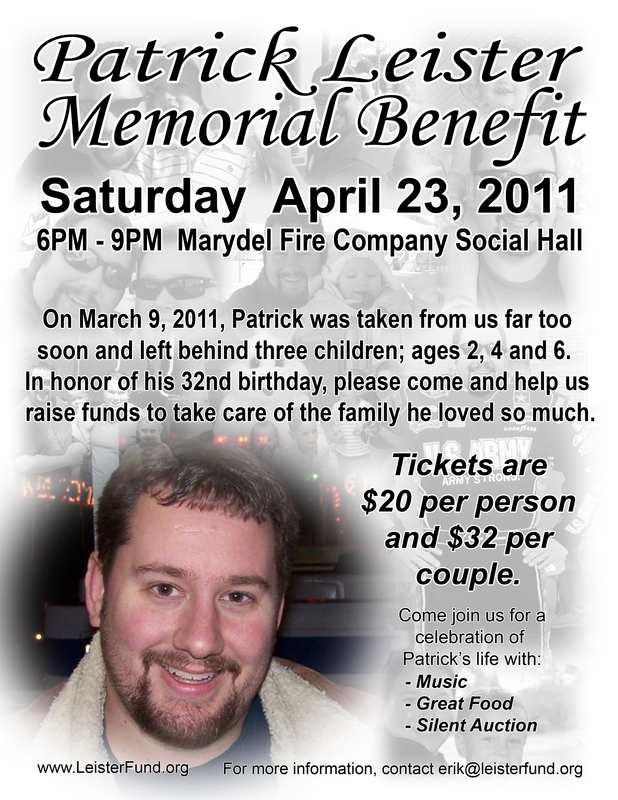 Join us on Saturday, April 23, 2011, at the Marydel Fire Company Social Hall - 110 Firehouse Lane Marydel, DE - in honor of Patrick's 32nd birthday. Tickets are $20 per person or just $32 per couple. All proceeds will go to support the Patrick Leister Memorial Fund. There will be great food, entertainment provided by A+DJ's, and a silent auction with many items to bid on. Check back often for an update on items that will be featured at the auction. Advanced tickets are not required and will be available at the door on April 23. Have something you're interested in donating to the silent auction? Contact us now for details. You can also click here for the latest update on donated items that will be available during the silent auction. Check out our Sponsors page and join us in thanking those who are donating their time and efforts in organizing the First Annual Patrick Leister Memorial Benefit! Help us spread the word! Download this flyer by clicking here and printing it off at home. Then share them wherever you frequent!